Honey Stop The Car! From the moment you walk into this amazing home…you want to keep on going to see what’s around the corner. That’s the 8 second rule. You have 8 seconds to make an impression! 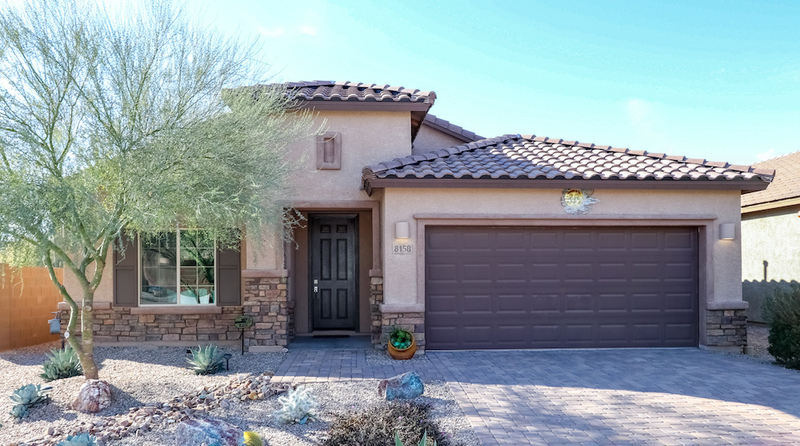 Welcome to this impeccable 2,135 square foot, four-bedroom plus den home in a highly desirable location…just minutes away from all the best that Northwest Tucson and Oro Valley have to offer! Attractive stonework, a brick paver driveway and entry, and tidy desert landscaping provide great curb appeal. An inviting entry opens to a bright. spacious great room and a quiet den with a double French door entry located just off the foyer – perfect for a home office, study, library, craft room, the possibilities are endless! 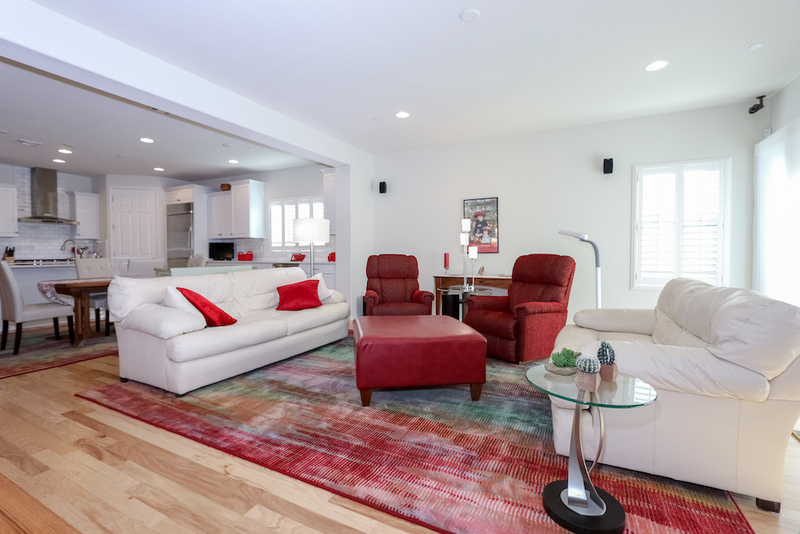 The bright and open great room provides free-flowing space from living to dining to the gorgeous kitchen – making both everyday living and entertaining comfortable and inviting. The well-appointed gourmet kitchen will especially appeal to the chef in the family! Quartz countertops, a large island, and corner pantry offer ample storage and workspace in this outstanding kitchen. 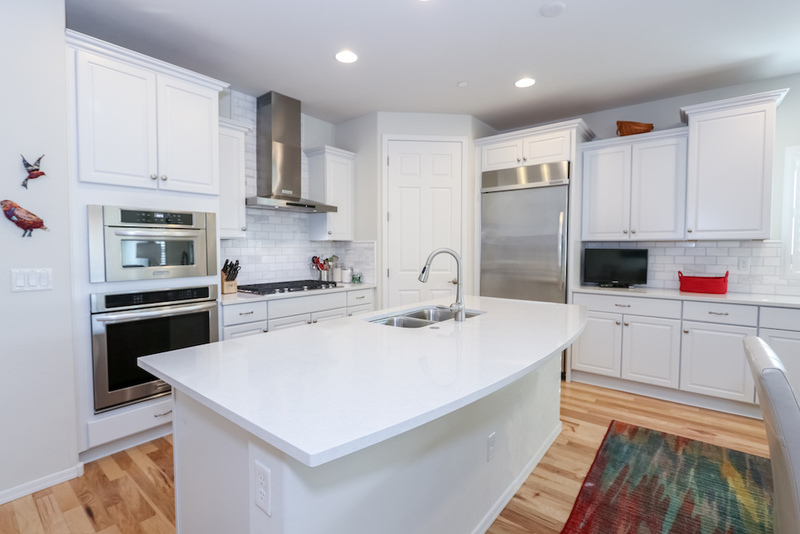 Also featured are KitchenAid stainless steel appliances, including a wall oven and microwave, a 5-burner gas range with a modern stainless steel hood, beverage cooler, and custom tile backsplash. The large adjacent dining area is perfect for family meals or hosting guests. The dining area easily flows into the comfortable, light-filled living room area featuring a triple-width sliding glass door overlooking the beautiful backyard. Gorgeous hickory wood flooring, custom plantation shutters, and thoughtful finishes unify the three spaces, highlighting the beauty and functionality of the main living areas. 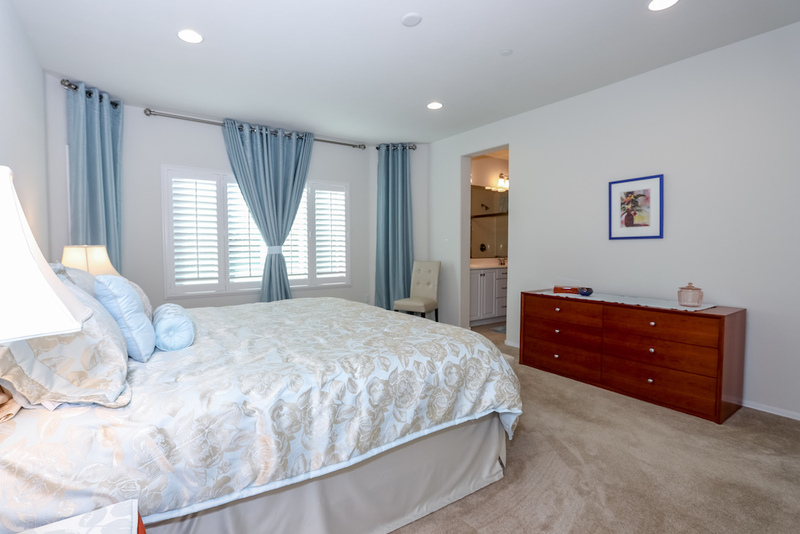 The split bedroom floorplan offers a private and a spacious owner’s suite. The room is bright and airy with plenty of natural light accented by the large bay windows and custom plantation shutters. An ensuite bath features a double vanity and walk-in shower. Three additional guest bedrooms with custom plantation shutters and a full guest bath with large soaking tub complete the home’s floorplan. Lots of cabinets and countertop space make for a pleasant workspace and extra storage in the laundry room. You’ll appreciate the wonderful setting for outdoor living the professionally-finished backyard offers! 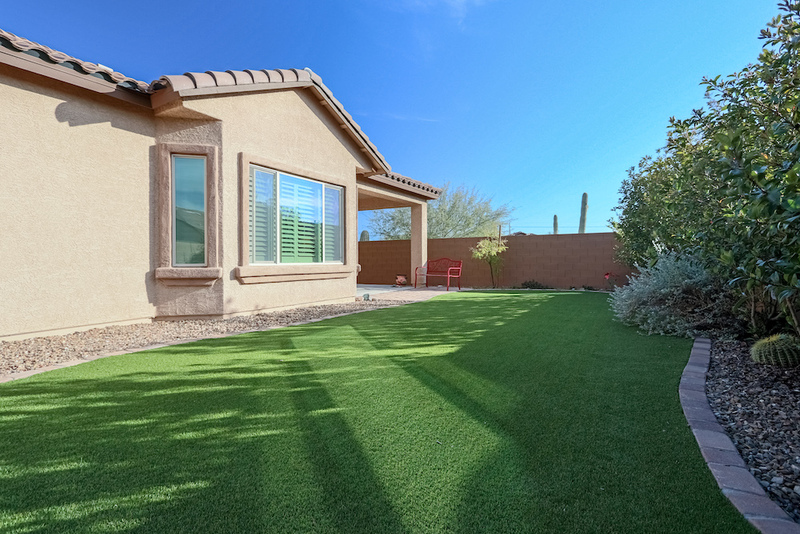 Low-care landscaping and a generously-sized artificial turf installation for year-round green grass will make yard maintenance a breeze, leaving you more time to spend relaxing in this gorgeous yard! A large covered patio with custom brick paver patio extension is perfect for enjoying your morning coffee or enjoying an evening with friends and family. Maturing vegetation along the back wall and community open space bordering the south wall of the home create added privacy. This exceptional home is located in a distinct, quiet enclave of all single-story homes in a prime Northwest Tucson/Oro Valley location offering convenient access to shopping, dining, movie theaters, parks, golfing, Northwest Medical Center, and more! The Foothills Mall and renovated AMC movie theater, as well as all the great shopping and dining options the Northwest Tucson and Oro Valley Oracle Road corridor has to offer are all just minutes away! 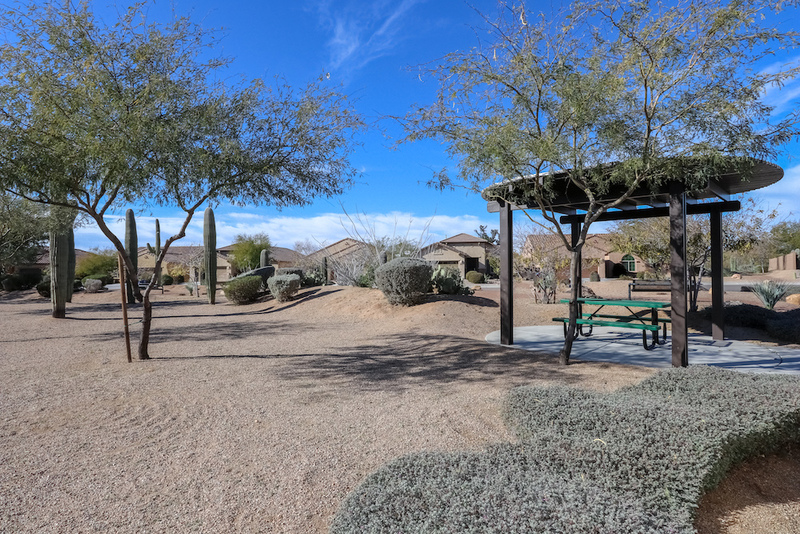 Also nearby are the top-rated Northwest YMCA and Oro Valley Aquatic Centers – wonderful options for recreation, swimming, and community activities! For golf enthusiasts, Omni Tucson National Golf is just a few minutes’ drive, not to mention the many outstanding golf courses Oro Valley has to offer. 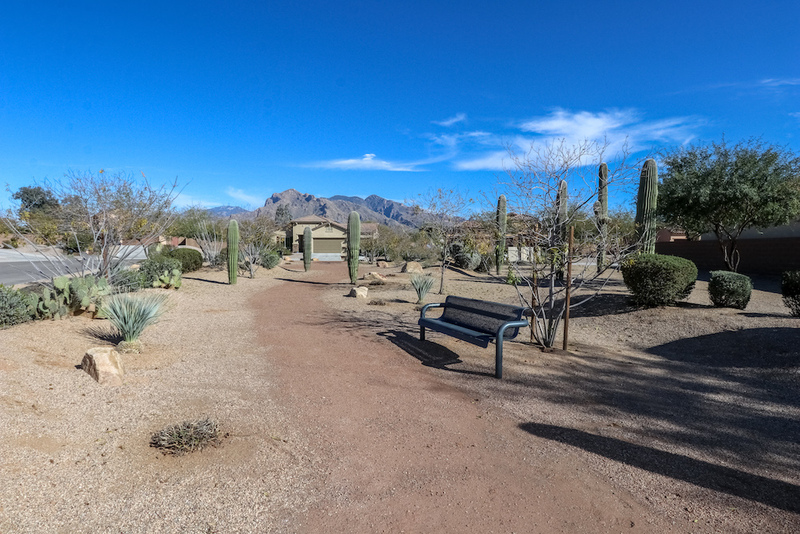 Catalina State Park is a popular nearby destination offering beautiful, easily accessible hiking trails and great opportunities for spotting desert birds and wildlife. A beautiful, move-in ready gem…you’ll love everything about this home and location! Easy To Schedule A Private Showing Now! Click Here.